I don’t feel welcome in the Remain side—the whole case for Britain remaining is built on a racist campaign about limiting migrants’ rights. The most publicised part of the deal that David Cameron negotiated is about limiting migrants’ access to benefits. He has already said that we abuse the NHS and welfare. So why would remaining bring down this racist propaganda? Other EU members now want to do similar things. Angela Merkel, the German chancellor, has said she wants to limit migrant workers’ rights. We’re witnessing a wave of racist scapegoating across the EU—if Britain remains then immigrants will pay the price. It is nonsense to claim that they would deport all immigrant workers—don’t believe it for a moment. My experience is that at least 50 percent of health workers are from outside Britain, so the NHS wouldn’t exist without migrants. As a Polish migrant who came to Britain trying to escape poverty and unemployment, I know what the EU is about. I would prefer to be in Poland with my family, my friends and my support networks. But Poland went through a neoliberal transition that was sponsored by the EU, which forced me to leave my country to look for a job. So I don’t feel any gratitude because I know what the EU has done to Poland—and Greece. And it’s all been in the interests of big business. Many people have fears about racism and the right benefiting. But this isn’t a choice between racists and anti-racists—there are racists on both sides. What happens afterwards depends on us and if we’re going to fight. parliament elections and the atmosphere was bleak. But now Ukip leader Nigel Farage is more marginal. If we fight and put the left case forward, we can win this argument. I wasn’t convinced about Britain leaving the EU, but now I support Leave. My concern was what impact it would have on EU citizens. Would I lose my rights? But there are a lot of British people living abroad and there would be repercussions from other countries if the government started targeting migrants. More so, it’s not in their interests to do so. While the government wants to limit access to the same rights, the economy wouldn’t function without migrants. Europe has not been built for the people—it’s been built in the interests of the big companies, big banks and big estates. Change from within would be difficult to coordinate and it wouldn’t be allowed anyway. We don’t have anything to fear from being outside the EU. Some migrants are afraid that if Britain left the EU attacks on migrants would be tougher. That’s because the Little Englanders in the Tory party and Ukip are leading Brexit. But it depends on the campaign. To counterbalance the right, the left needs to make the arguments. While it might seem scary to be outside, it’s our best chance to make a better Europe. If Britain leaves that would start changing Europe—it would encourage people to fight against the EU. If you don’t like how the EU was built and works then we need to deconstruct it. Being in the EU doesn’t stop racism rising. The right wing tabloids have been talking negatively about Muslims and migrants after the Paris and Brussels attacks. The only way to push back the racist agenda is by campaigning, but we’re in a good position to do that. Most workplaces in London have people from different parts of the world and bosses are attacking everyone’s pay and conditions. To protect workers and migrants’ rights we have to go the way Iceland did and topple some governments in Europe. It’s a very popular argument that migrants wouldn’t be here without the EU. But people came to Britain for many years before the EU because the economy was booming. And people from outside the EU are here now. There’s also the idea that the EU protects multiculturalism in Britain, but the EU doesn’t change people’s perceptions of migration. When times are tough it’s easier to convince people to scapegoat migrants, like when Gordon Brown talked about ‘British jobs for British workers’ in 2007. We’ve got to argue that we’re all workers with the same problems and the same interests. We need to stress the unity of workers across Europe. I’ve lived in a European country that was hit by the EU’s “rescue packages” and austerity. So I have a very clear idea about what the EU is. It’s a coalition that goes after anybody who doesn’t conform to neoliberalism and this contradicts the idea that it’s democratic. For Greece, leaving the EU would be an act of rebellion. I’m not sure what it would mean for a powerful country like Britain to do it. But the EU doesn’t serve the interests of people and I believe in Britain leaving. I don’t believe there will be more feelings against migrants if Britain leaves than there are now. In Greece racist feelings started rising after the “memorandum” that imposed austerity and that’s when the Nazi party Golden Dawn began growing. Austerity helped that fascist party become so popular and it’s why migrants are being attacked by fascists. The EU has never done anything to prevent racism and its policies create more. How has it helped anti-racist struggles? You can’t say we should be for remaining just because some on the right say leave. 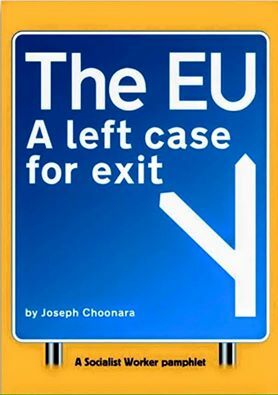 In Greece Golden Dawn and the left argued to leave the EU, but for totally different reasons. I’m undecided about the EU, but I’m leaning towards Leave. Migration policy doesn’t work at all—look at the Mediterranean. EU policies don’t protect migrants. If governments want to discriminate against you they will. What upsets me most is the way migrants are being treated now—it’s terrifying. It needs grassroots initiatives to change attitudes. There may be a period of instability and change if we left the EU. But my workplace, and those where my friends work, would fall apart without migrants. The EU is meant to be about improving everyone’s life, but the EU didn’t help everyone in Poland. There were some good things, such as the convention on prisoners’ rights, which improved prisoners’ conditions a little bit. But there’s still huge inequality in Poland and among EU member states too. People wouldn’t be leaving the country if the EU was helping so much. The right is using the EU referendum to ramp up racism against migrants and refugees. Many migrants and the left understandably fear that Britain leaving the EU would mean deportations and rising racism. Of course the Tory right and Ukip do want tougher immigration controls. But they face opposition from some bosses who rely on migrant labour and, more importantly, from migrants and anti?racists. The bosses’ Financial Times newspaper and the bosses’ CBI are strongly in favour of immigration and remaining in the EU. But politicians and the media regularly target migrants—and Britain enforces border controls. We can’t rely on capitalist logic to defend migrants. Migrants from outside the EU can already be locked up in detention centres. But campaigners have built solidarity campaigns and protests and tried to stop the flights. In a time of crisis and scapegoating, migrants will come under attack whatever the vote on 23 June. But the fightback is made harder by being part of an EU based on neoliberalism and racist controls. The only way to defend migrants’ rights is to build a mass movement against racism that forges unity between all workers. LETTERS: Would leaving the EU boost the right or damage the Tories?